New bishop: Bishop Gregory Homeming surrounded by bishops and priests at his ordination as the sixth Bishop of Lismore in St Carthage’s Cathedral on February 22. AUSTRALIA’S newest bishop Gregory Homeming has stepped into the role in Lismore diocese concerned not so much with power, but ready for grace in weakness. Addressing the crowd at the end of his ordination and installation as Bishop of Lismore on February 22, Bishop Homeming, a Carmelite friar, said “at this moment I’ve little idea of what a bishop’s job is”. “I am your bishop, with the emphasis on ‘your’,” he said to the people in St Carthage’s Cathedral. “The people, religious and priests of Lismore will show me my job. “I will listen to you and, together, we will discern God’s will for our diocese. “Our weaknesses and failings will not be an obstacle because I believe they will guide us. Bishop Homeming, 58, was formerly regional vicar of Australia’s Discalced Camelite Friars and has been with the order for 31 years. “Over those 31 years I’ve struggled with my own weaknesses and failings, and tried through them to find God,” he said at the end of his installation Mass. “Jesus has entered my life through my weaknesses and in them I have been graced with the experience of the living God. “My ministry as a Carmelite has included retreats and lots of spiritual direction. “In this I have tried to help people with their own weaknesses. “I’ve tried to show them that Jesus comes to them through their struggles and that, with prayer, they can experience God in the deepest experiences of life. Bishop Homeming said his role as the sixth Bishop of Lismore was that of “a shepherd who leads his people with a simple focus – to stand in the presence of God”. “I pray that I will not be an obstacle,” he said. “I pray that you will come to know the love of Christ and be filled with the utter fullness of God. “Let us treasure Christ through the Word of God. Let us carry this Word in our hearts so that, meditating on it, it will accompany us in all that we do and say. “Let Christ be our constant companion and friend. 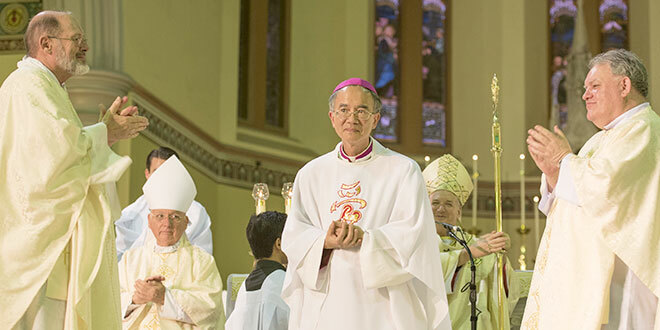 Sydney Archbishop Anthony Fisher, who was the principal ordaining bishop, said in his homily that “as our first Chinese-Australian prelate, Bishop Homeming is a sign of the changing face of the Church in Australia”. Referring to the Royal Commission into child sexual abuse and its scrutiny of the Catholic Church, Archbishop Fisher said, “there can be no doubt that many episcopal, priestly or religious shepherds failed in the past to protect the lambs of Christ’s flock as they should”. “Some betrayed the mission given them by Christ and the trust given them by His people,” he said. “At this time the Catholic community and especially the bishops hang their heads in shame, in apology, in determination to ensure such failures do not happen again. “Some might think this is no time for making new bishops; I sympathise with their disenchantment. “But there is a providence in God calling a man like Greg, with his legal background (lawyer in Sydney from 1981-85), critical intelligence, spiritual wisdom, pastoral sensitivity, and gentle soul to help lead us forward at this time. Bishop’s Homeming’s predecessaor Bishop Geoffrey Jarrett was a principal co-consecrating bishop, along with Wollongong Bishop Peter Ingham.